'If you ask me, of course, I want a rematch,' Manny Pacquiao said about another match with Floyd Mayweather. NEW YORK — Manny Pacquiao said Monday that his surgically repaired shoulder is 80-90 percent healed and he expects to resume training in November or December, with a return to the ring in March. Pacquiao acknowledged that Amir Khan was a possible opponent, but added no determination had been made. Pacquiao had surgery on his right shoulder four days after he lost by unanimous decision to Floyd Mayweather Jr. in boxing’s richest fight ever in May. Mayweather says he’s retiring, though Pacquiao recognizes that in boxing, those vows don’t always hold up. "If you ask me, of course, I want a rematch," Pacquiao said. "I heard that he retired already. If he really retired, then there’s no rematch. 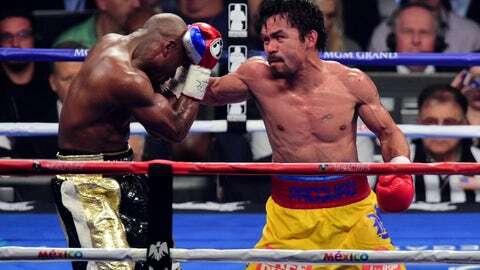 But if not…"
Pacquiao injured his shoulder three weeks before the fight. He later said he aggravated it in the fourth round, when he landed some of his best punches of the night against Mayweather. "He kept moving around and didn’t want to fight toe to toe with me, exchanging punches," Pacquiao said Monday. Asked if he could change that in a rematch, Pacquiao said, "I think so, especially (after) I fixed my shoulder." Pacquiao, a congressman in the Philippines, was in Manhattan to be honored with the Asia Society’s Asia Game Changer of the Year Award. He is running for the Philippines’ 24-seat Senate, a national position that has been used as a springboard for vice president or president.